Set up an account or tag your existing Bendigo Bank account to The OTIS Foundation by visiting your local Bendigo Bank branch and quoting agent code 4419. The Bank will then pay a commission directly to OTIS – at no cost whatsoever to you. Supporting the OTIS Foundation is as simple as doing your banking. 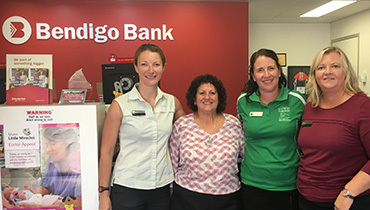 Bendigo Bank customers from anywhere in Australia can link their accounts to support the OTIS Foundation Community Enterprise. This means that you can link your new or existing Bendigo Bank account to the OTIS Foundation Community Enterprise and OTIS will receive a monthly commission at no cost whatsoever to you. OTIS Foundation supporters will be offered the same products and services, at the same rates, as all Bendigo Bank customers. It will not cost you anything, nor will it affect your account in any way. So, for a simple way to support OTIS, consider linking your existing Bendigo Bank accounts to OTIS or move your banking to Bendigo Bank to allow OTIS to continue providing retreats to women living with breast cancer at no cost. Please note - eligible accounts include all regular savings accounts, home loans, personal loans etc. Moving your banking is easy – quote agent code 4419 at any Bendigo Bank branch. The OTIS Foundation acknowledges the generous ongoing support of its Principal Partner, the Bendigo Bank. Since the foundation was established the annual income stream provided by the Bendigo Bank has contributed significantly to the organisation.